My sister Mary earned the honor of being the first guest at the NickMoore Hotel in Bangor, Maine. 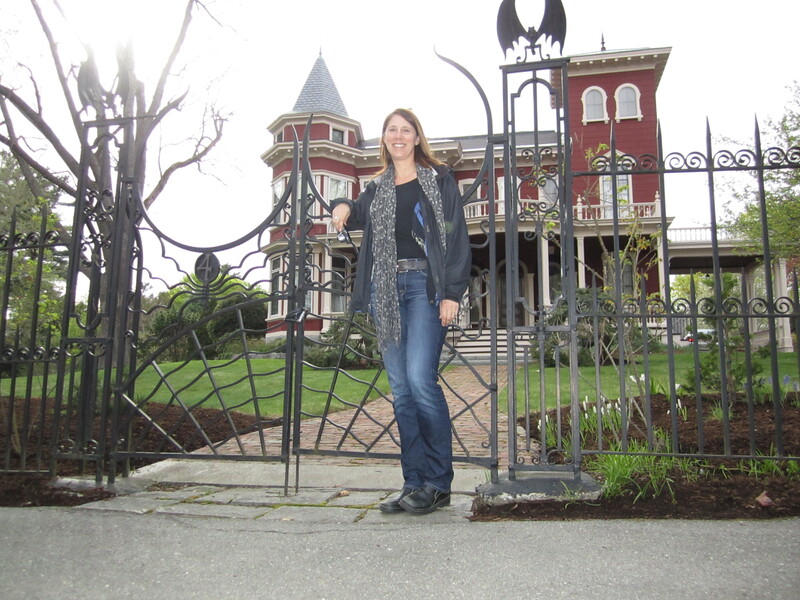 After a quick and easy airport pick-up, the first stop on the Bangor Tour was Stephen King’s mansion. Mary posed at the custom-made wrought iron gates outside the best-selling author’s West Broadway home. • A seven-mile hike up into the clouds of Cadillac Mountain in Acadia National Park and back down under glorious sunshine and stunning ocean views. • A personal tour of the recently restored 19th century Low House by homeowner, historian, roofer, room designer and true artist — the Amazing Jody. • Dining on delicious pastries at Chase’s Daily in Belfast, Maine…just don’t arrive between 10 and 11 a.m. on a SATURDAY MORNING if you want any food. • Viewing the work of famous turn-of-the-century illustrator W.C. Wyeth at the beautiful Farnsworth Museum in Rockland, ME. • Shopping at the Big Chicken Barn: the biggest antique mall/used bookstore in Maine….and it’s really in a chicken barn. So do like Mary and book a reservation at the NickMoore Hotel…but remember we live in Maine…so like Chase’s Daily, the NickMoore will not be open during peak visitor times…it will be closed between May 20 and August 20. Hey, fall is a spectacular time to visit Maine and there are rooms available. I highly recommend the NickMoore Hotel! What could be better than hanging out with Jen and Mark in spectacular Maine! What a great time! Thanks Mark and Jen! Sometime the NickMoore hotel will need to be open in the summer–the very best time to visit Maine! Does this make you guys “Markifer”? Looks like a fun visit!